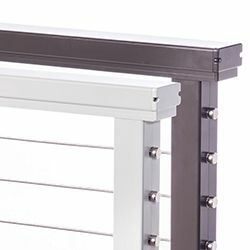 These top rails are made with the same material and similar shape to our aluminum posts, for a complete rectangular railing frame. In addition to the standard rail piece, we also have matching corner pieces, splices for long runs, decorative screws and more; Everything you might need for an aluminum top rail. Available in five colors, like all our aluminum products: black, bronze, natural, clay, and white. Combine this top rail with our ALUMINUM POSTS. This material is also available as a SHAPED TOP RAIL or POST-TO-POST RAIL, which can be used as a handrail or as inline support for one of our WOOD TOP RAILS.